So I popped in to my local Spotlight store a few weeks ago with the very specific intention of grabbing some elastic and a particular ribbon I needed ... yeah like that's ever gonna happen. I came out with about $50 worth of stuff ... oops! Come on ... I know I'm not the only one that does that! Fess up!! 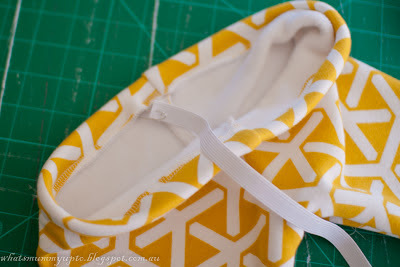 Anyhow, my star-find that day was this gorgeous plush mustard yellow tribal-ish looking fleece. I'm in love with this fabric. The brushed back-side of this is the softest, most smooth and snuggly-feeling fleece I've ever seen. Just think about those super-soft baby plush stuffed toys ... yep, that's what it's like. I had no idea what to make out of it, but with winter fast approaching, I grabbed a metre in the hope some inspiration would come along. Anyway as is typical with my project planning, the idea evolved A LOT before it was made. 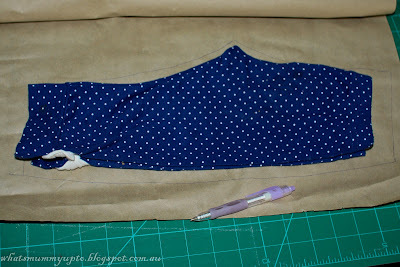 I started with planning to make a winter dress for Bethany and pinafore for Hannah. But after a bit more thinking about what they actually need in their wardrobes this winter (LOL ... "need" - I'm kidding myself. These girls never NEED any clothes), there has been no dress or pinafore, but some little sweat-pants-with-a-twist for Hannah. They're kinda tighter like leggings, 'cause I like the way leggings look, and I love the warmth of sweat-pants, but they can look a little daggy. So this is a compromise, a have-your-cake-and-eat-it-too type effort. In fact, these little Sweat-gings (OK, so the name is still a work in progress) started a run of winter wardrobe sewing for both girls. After the first mustard pair, I raided my Mum's stash of winter fleece that she's had since she ran a children's clothing business many eons ago, and made Hannah 3 pairs in all. I also managed some for Bethany with this beautiful floral fleece. Oh, and what did Bethany score from Mummy's fabric-crush? A skirt! I love the way this fleece sits in this skirt, which is just your basic rectangle with elastic in the waist. I added the extra band on the bottom of the skirt because it adds just a little more weight and makes the skirt sit just that bit nicer. Oh, and the gorgeous light-weight cardi Bethany is wearing here is from this tutorial. I've been wanting to try this one for a while, and the bright watermelon colour in the original design prompted me to give it a go for this outfit. I thought the colour would contrast well together with the mustard in the skirt, and I really love the combo! 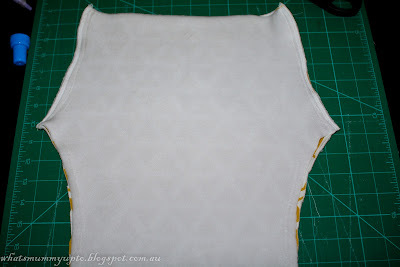 The white top underneath is from this tutorial, one I've also had on my to-do list for ages. iCandy handmade is a great in case you didn't already know that! These were both super-easy and quick with free pattern downloads too! 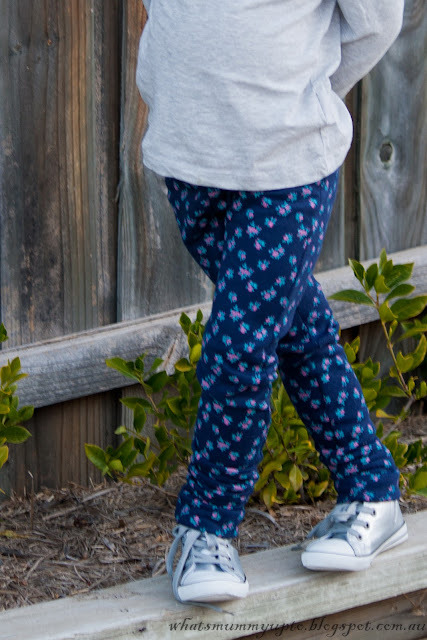 Bethany may be getting a few more of these tops if I can get my hands on some cute knit-prints. - Sewing machine and Overlocker (Serger) - Though the overlocker is definitely not an essential for this one as fleece doesn't fray, so leaving the seams with raw edges would be totally fine. 1. Grab a pair of currently fitting leggings fold them in half and trace around them, leaving an additional 1 1/2 inches at the waist to allow for waist-band. 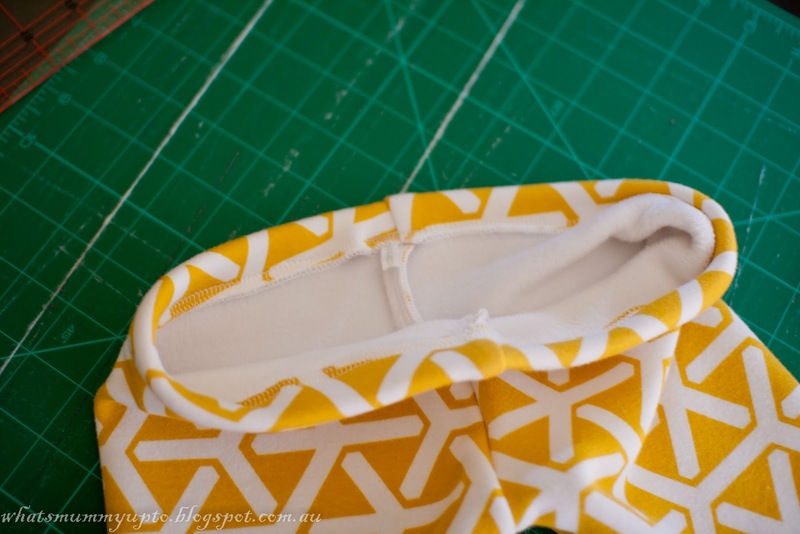 Leave a 1/2 inch seam allowance on the straight and curved sizes. 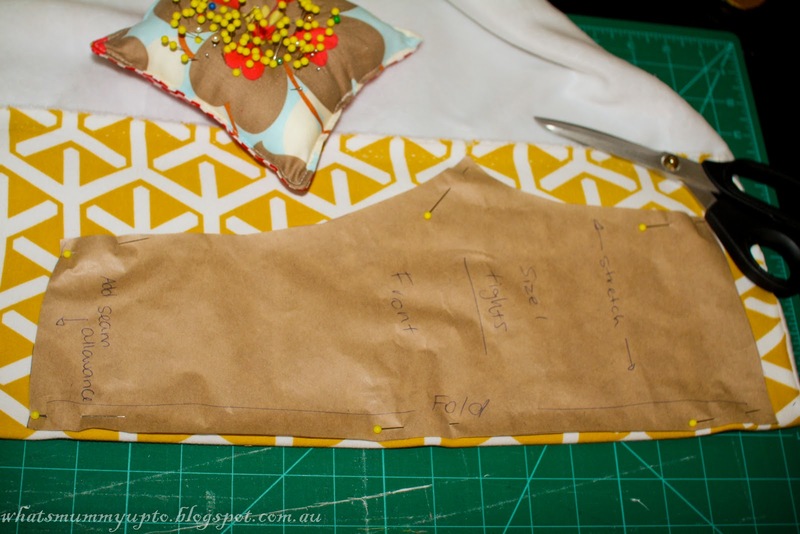 Leave 1 1/2 inches extra at the waist to allow for turning a waistband. 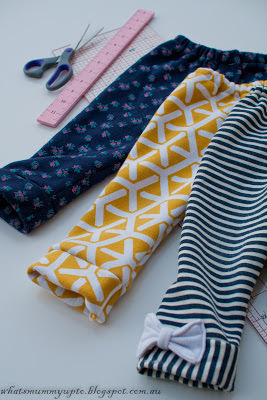 No need for any extra allowance at the bottom of the leg, 'cause we'll be adding a cuff. 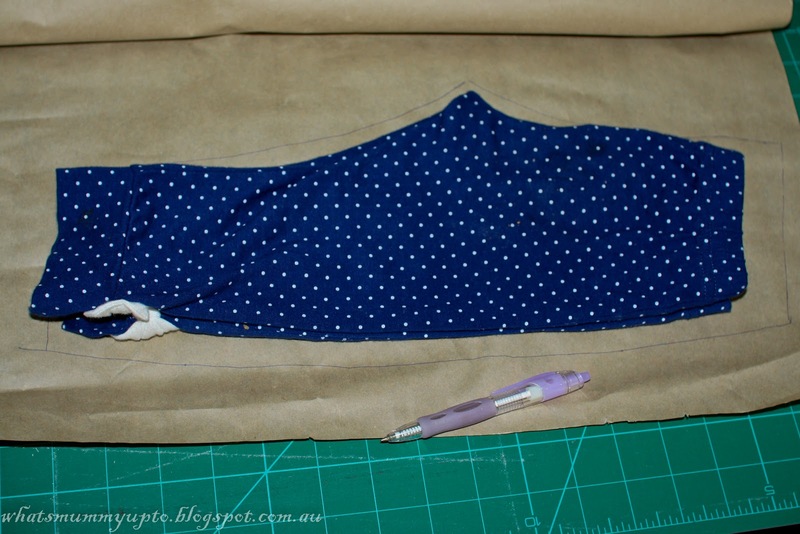 Cut out your pattern piece. 2. Fold the fabric and place the straight edge on the fold and pin. The stretch should run across the the pattern. You might be able to make out my markings on this pattern. 3. Cut 2 pieces. When opened out they should look something like this. 6. 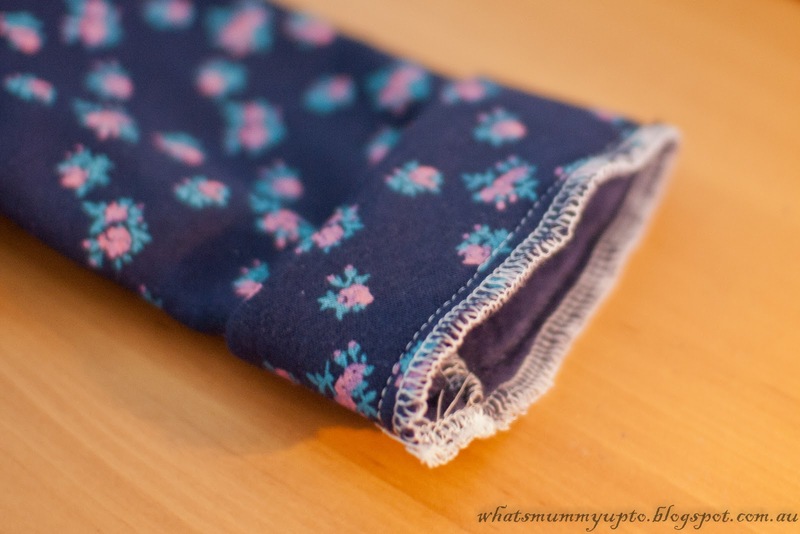 Overlock (if you have an overlocker) around the waistband. Fold your waist-band down 1 inch, and sew around, leaving a 1/2 inch opening to allow the elastic to be threaded through. 7. 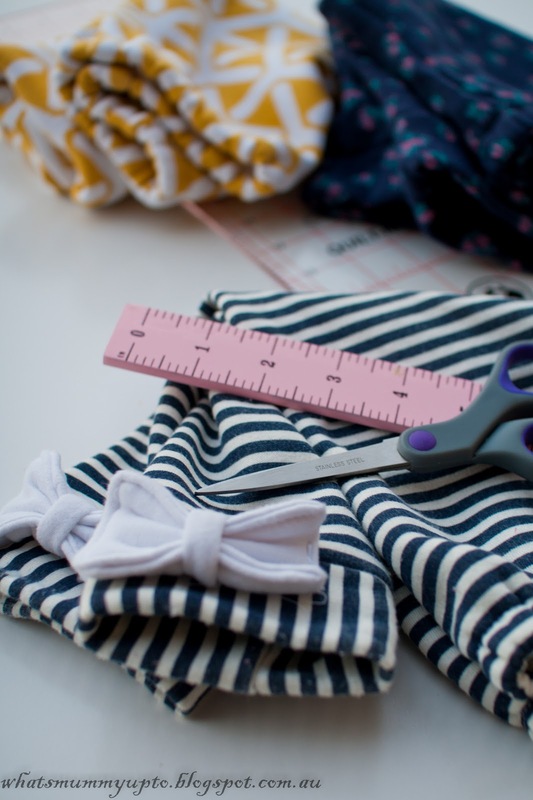 Measure your munchkin's waist and cute the elastic to this length. 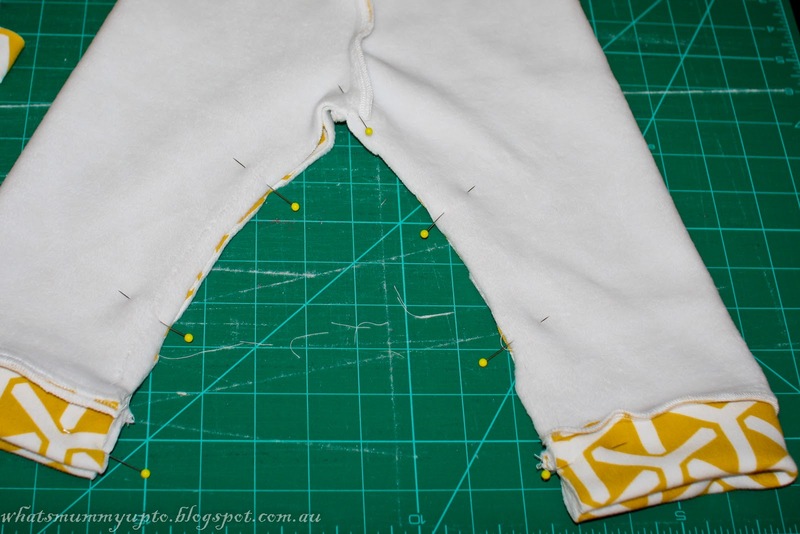 Thread the elastic through the waistband using a safety-pin. Overlap the ends of the elastic about 1/2 inch, and sew down. 8. 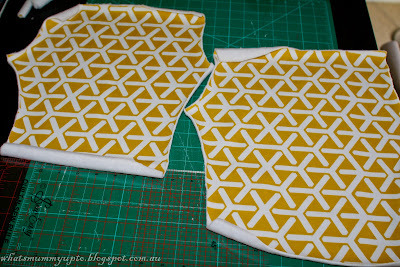 Now to make the cuffs ... Place the little pants flat on the table, and measure the width of the bottom of each leg. Mine were 4 inches. Grab some offcuts of your fabric, and cut 2 rectangles that measure 2 x width by 4 inches. In this case, the rectangles were 8 inches (i.e. 2x4") by 4 inches. 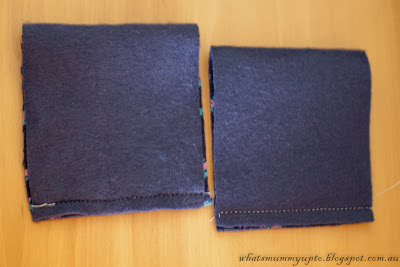 Fold the cuffs in half right sides together along the long side (to make a square shape) and sew using 1/4 inch seam. 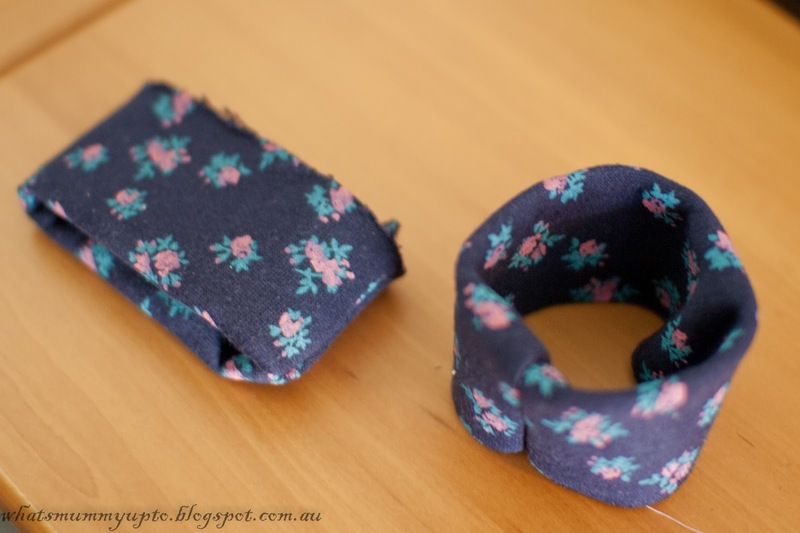 Turn the cuff right side out, then fold in half long-ways to make a band, right side out. 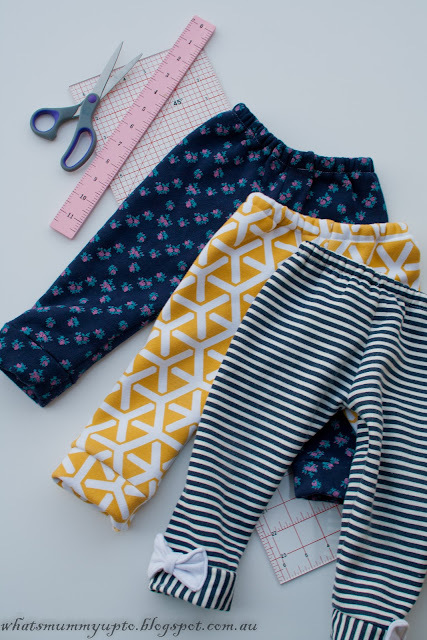 Turn the little pants right-side out, and place the cuff over the pant leg, lining up the raw edges of the cuff with the raw edges of the pant leg. 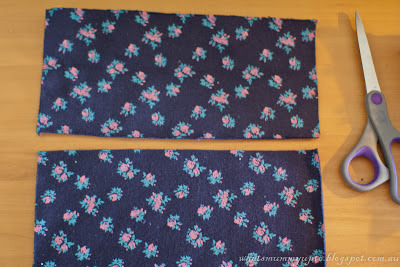 Line up the seam on the cuff with the seam on the pants, then pin in place. You may need to stretch the cuff slightly to fit the pant leg. Sew around the raw edges using a 1/4 inch seam allowance. (You should be sewing through 3 layers of fabric .... 2 layers of cuff, and 1 layer of pant-leg). Finish off the seam by overlocking. Then flip down the cuff, and you're done. If using a stripe or any directional print, it can be fun to rotate the direction for the cuffs like in this striped one. A little bow or other decoration can add a little interest too ... have fun with it! 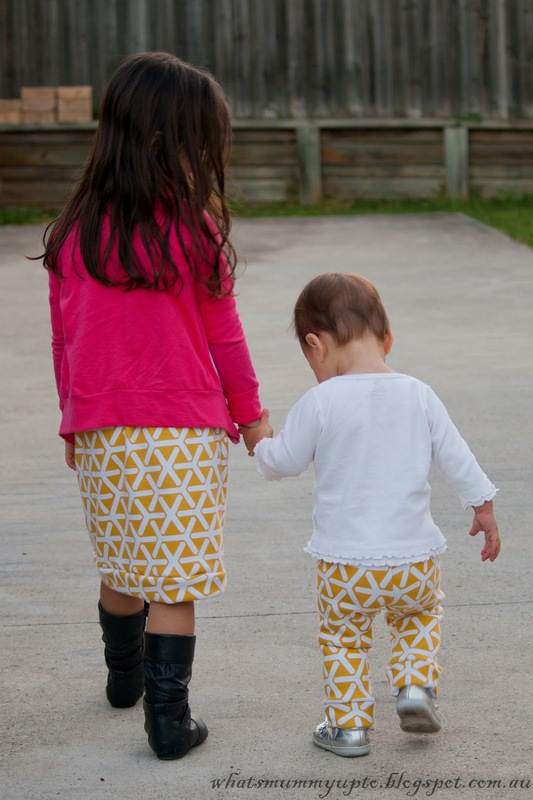 I think I'm making a habit of the matching-but-not outfits for my girls. Don't worry, this is the first and only time they'll be wearing them on the same day. 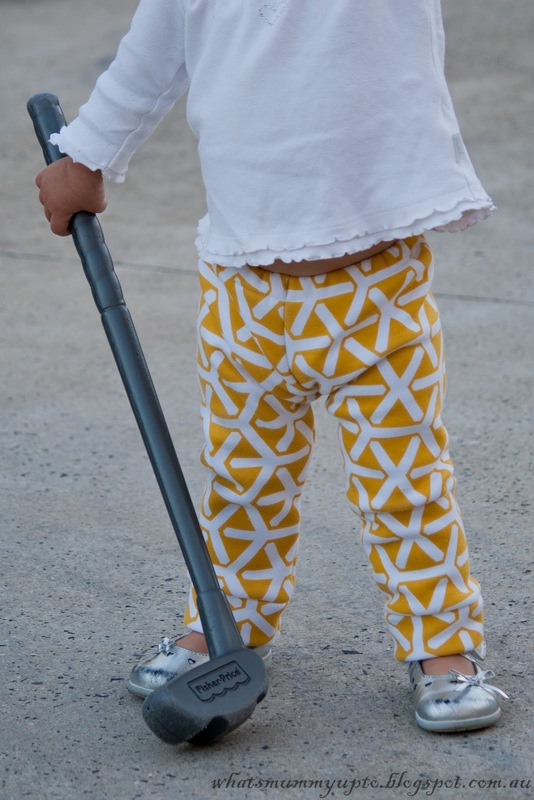 Oh, and this photo just melts this Mummy's heart! I just love watching what great little friends they're becoming now that Hannah's well and truly out of her baby-phase. I love the last photo, too :) Love the fabric! Thanks Jenya! I was excited to find your blog today ... love all your projects! 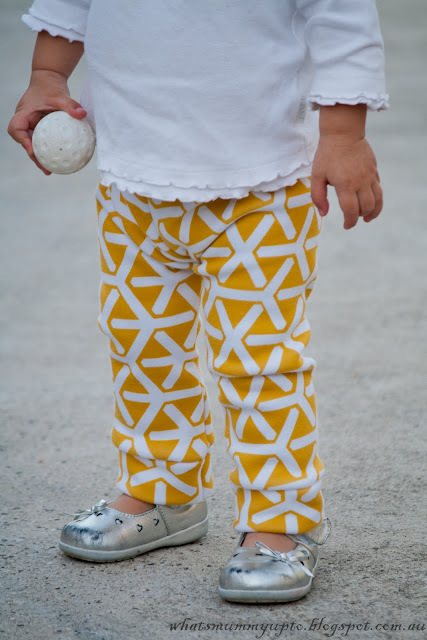 Very beautiful.. skirt and leggings both on same fabric. 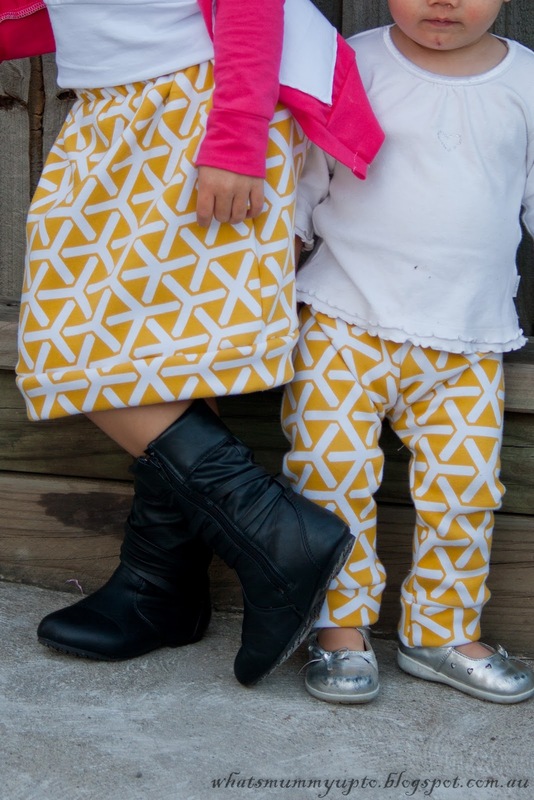 Hi there, I made a size 2 with the mustard colored fabric. But you can make whatever size you like using my instructions. You'll just have to adjust up for fabric requirements accordingly. Aww! These are such pretty leggings. I have always been happy to have a niece and I also lve shopping for her. This post is awesome. It is also her birthday next month and she has also started waking. These are going to look so cute. I am so happy to have found this post.